Blue is breezy. Blue is energetic. And blue is one of the most popular colors out there. 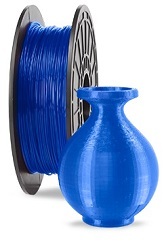 Our Dremel Blue filament builds models in a deep, rich blue with an iridescent luster.